D.Nd: Poisoned is a free visual novel created by developer Akane. So, what’s this visual novel thing, you may ask? It’s like a story that unfolds before you, and the few actions and decisions you make may influence its course. That said, it’s not really a ‘game’, but more of a short tale which you live. In D.Nd: Poisoned we play the role of a 14-year-old boy named Mello who, coincidentally, looks a lot like a girl. He’s the second best student in the Wammy House Orphanage, a place where brilliant orphans are gathered and trained to fulfill a purpose: become copies of L, the greatest detective ever. 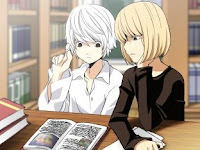 Mello wants to be number 1, but for that he has to beat Near, a pale boy who is as brilliant as cold and distant. One day, teacher Roger decides to assign them both a project and make them know each other and work together, for better or worse. The novel is filled with Mello’s angst and obsession with near, and our interaction happens through some answer choices and strolling through the few house rooms (less than ten). However, what we choose determines the tension between the two boys and even the way Mello sees Near – is he building on his anger or becoming fascinated with his rival? Clocking at less than one hour per game, the different endings call for repeated play and the search for all outcomes, and looking for the adult content (boy x boy) is surely one of the strong points of D.Nd: Poisoned for anime fans. Visuals are extremely clean and nice, although lacking in animations. However, the art style is definitely catchy and the music, varying from depressing but beautiful piano tunes to other more cheerful compositions is very nice. D.Nd: Poisoned is worth checking. The story is interesting, with Mello’s inner demons and the various endings. Fans of anime will get the most out of it, but others may also like this brief tale.